From the rubble of #FakeNews, cherry-picked truths, and reality bubbles, America is quietly having a journalism renaissance. Freedom of the press and speech are flourishing beneath the fog of our culture wars. In journalism, as with music and TV, we must sift through steaming surpluses of Minajes and Kardashians to find the next Aretha Franklin or Lucille Ball. The talent is there, we just need to harness it. Below is a formula for doing exactly that – making American journalism great again. And it’s entirely in our control. Yes, those are actual lyrics. 1) Power of choice. It’s silly to paint “the media” with such broad strokes when there are so many outlets. Some are clearly better than others. Like Game of Thrones and Black Mirror attracted subscribers and cash to HBO and Netflix, quality news operations like Vice, OpenSecrets and ProPublica allow us to choose how good or crappy our news will be. If enough people make good choices, crappy outlets will wither and die unwatched. You can check out my list of trusted sources here. They mights still screw up on occasion, but they’ll fix mistakes, hire better people, and set higher standards. 2) A motive mightier than clickbait. It’s important to separate media companies’ motivations from those of journalists. Yes, companies compete on clicks and views in the short term. But in the long-term, their survival depends on their credibility. It’s why major networks fired Brian Williams for lying, Dan Rather for screwing up, and Charlie Rose and Matt Lauer for hornballin’. No matter how beloved or successful, no individual can be allowed to tarnish a company’s reputation. By comparison, FOX News encouraged a ‘good ole boy’ hookup culture, choosing to pay $32-million harassment claims instead of firing the perpetrator. Eventually, this imploded. Ailes, O’Reilly, Bolling, and others got booted. Ratings tanked and lawsuits persist. Everyone else is now on notice. Integrity outlasts clickbait. As for journalists, I don’t believe for a second that thousands of college grads enter this low-paying profession to produce steaming piles of lies. Many are idealists, who want to do the right thing. But almost all are something far more important: professionals. More than getting clicks or favoring their team, they want to do work they’re proud of. They might still be wrong, but rarely malevolent. Personal integrity is a powerful check on dishonesty that isn’t given nearly enough credit. To believe anything less is to flirt with a dark cynicism that sees the world – and those in it – as irredeemable. This integrity argument also applies to media executives and even politicians. The integrity argument does something more important – it invalidates the concept “evil”. Everyone thinks they’re doing the right thing – and they are! The only question is for whom? For themselves, their family, state, business, country, god…?? Serving any one party can leave others feeling shortchanged. People casually accuse Trump or Planned Parenthood or FOX News or “socialists” of being “evil”. Of acting with malice. What if there is no malice? What if there is no evil? What if they’re merely doing the right thing, often with integrity, for someone who isn’t you. YOU aren’t being served. Seeing people’s intentions through this lens can eliminate some of the harshness and vitriol we see in the world today. What it can’t eliminate is the possibility that your noblest ideals, manifested, may well be your utopia…and someone else’s nightmare. 3) Bias has been neutered. It’s true, most journalists lean left. Given the choice, they’d choose right wing scandals over left wing ones. Today, that’s impossible. The big, juicy ones are like Jason from Friday the 13th, they can’t just be buried. Surrounded by subversive actors like Wikileaks, foreign news agencies, countless blogs, leakers, social media sleuths, and pundits, dead bodies will float to the surface. And media is compelled to fish them out. Even the most sympathetic, leftist journalists couldn’t bury the Hollywood perv outbreak, Hillary’s emails, and DNC’s Berniegate. Individuals can easily neutralize leftward bias with good analysis by smart partisans (“Smartisans”) of all leanings. I made a list of left, right, and independent thinkers that do exactly that. This is happening. Trump is a byproduct of people losing faith in media, in government, and each other. Media has to earn that trust back to reclaim its watchdog role by informing audiences, instead of titillating them. In turn, informed citizens will push for better representation. There’s already plenty of great reporting scattered all over the web – Washington Post, WSJ, LA Times. Plus, no one wants the shitstorm of botching this opportunity. There’s a general sense on the right and left that Trump is all the margin of error this country can afford. 5) Onus. We’re finally waking up to the reality that we’re a huge part of the problem. We are weak and manipulable. We click and share what revolts us – or what we desperately want to believe. Dogmas don’t demand truth, only validation. Facebook and others prey on these frailties, serving us the reality we want, not the one we need. That means it’s on us to think critically, seek evidence, and consider diverse viewpoints whenever we’re triggered. Slowly, we’re developing the tools to counter the digital onslaught. At the same time, seeing these companies for what they are – dopamine dealers – and demanding they change. Misdirected focus. The real problem isn’t left vs. right bias, it’s national vs. local. The economics for investigative journalism disintegrated as the internet killed local newspapers. There’s no scale in local reporting. But local policies affect our quality of life way more than national ones. Local politicians and power brokers are getting away with murder without independent media to keep them accountable. This is a problem crying out for entrepreneurial ingenuity. The Media-Political Industrial Complex is a bit more complex. As I illustrated in #3 here, all the loot raised for political campaigns is spent on advertising. Then, media companies and moguls use that loot to bribe (“lobby”) politicians for policies they want. This has led to massive consolidation, concentration of power, and subtle curbs on speech – as incumbents squash perceived threats. Social networks now monopolize access to our friends, family, colleagues, and fans. So getting banned or “demoted” (algorithmically) on Facebook effectively silences free speech. We have yet to confront that reality. They too, answer to advertisers, not users. This is inevitable. When a dominant platform can block you from family/friends/colleagues/fans, it’s effectively silencing #FreeSpeech. There’s legal precedent: US malls are regulated as public spaces. Until everyone’s incentives are realigned – and citizens (not advertisers or magical billionaires) pay for independent news, no outlet can ever fully be trusted. Donate to high quality, independent news sources like ProPublica, NPR, OpenSecrets, and WikiTribune. Share only stories from high quality sources. Resist the sensationalist fluff. Seek out opinions that differ from yours. Try to understand their motivations. Do it in person, not online. Support campaign finance reform to end political corruption, especially of media. Get involved in local politics. That’s what truly improves people’s lives and lot in life. 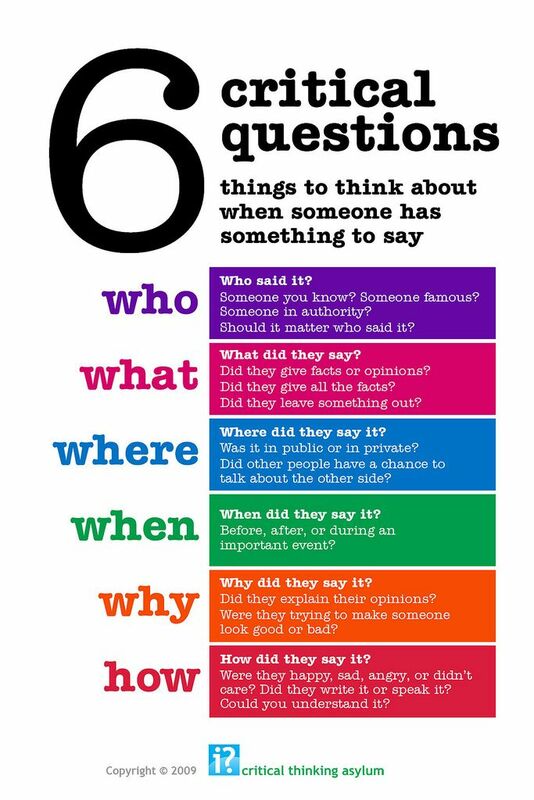 Practice thinking critically. Here’s a chart to start with. If you liked this, share it. And sign up for the newsletter below.